Can you imagine how novel it would be to see a Muppet-style puppet as your Master of Ceremonies, guiding you and your guests through your corporate event? You have the choice of two monster emcees – Our crowd favourite, Troggg (with three Gs) in the blue fur. Or Moss in the green fur. 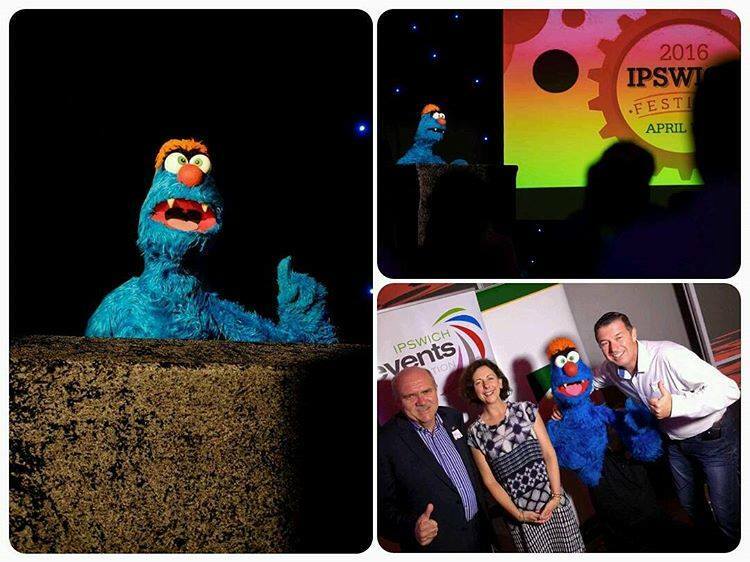 As MC, Troggg has hosted the 2016 Ipswich Festival Media Launch (which included introducing Mayor Paul Pisasale to the stage), the premiere screening of “I Am Big Bird” at Event Cinemas Myer Centre, The Hills Carnivale, the Brisbane Backyard Film Festival, the Griffin Community Christmas Carnival, the Rope Inc. 2017 AGM, a screening of “The Muppet Movie” at New Globe Theatre, various launches, parties and other special events. Up to 4 hours of time hosting the corporate event. Time allowance for travel and set up of lectern/table, audio equipment/mic, scripting and run sheet, and puppet host. Time for preparations and rehearsals in the lead up to the event. The initial 50% deposit to lock in the booking is $225. This ensures that the date and time is secured and yours. Nobody else can book the same date and time if the deposit is paid. And then the remaining $225 can be paid in cash on the day of the event, or via direct deposit. Details of Payment Methods here.